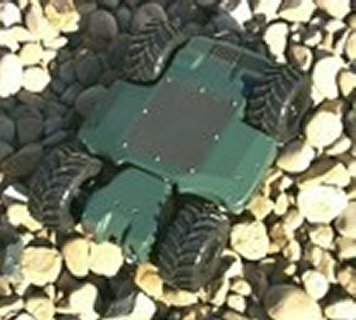 Dragon Runner is a small, four-wheeled, rear-wheel drive, front-wheel steer, man-portable mobile ground sensor designed to increase situational awareness. It will give tactical Marine units the capability to "see around the corner" in an urban environment. Dragon Runner is part of the Marine Corps Warfighting Lab's Project RSTA, an effort to develop a reconnaissance, surveillance and target acquisition network of sensors that portrays a picture of the battlespace, enabling enhanced situational awareness for small unit leaders. Small, tactical units rely on their eyes and ears for force protection and reconnaissance, surveillance and target acquisition information. In today's battlespaces, small unit leaders increasingly enter urban or complex hostile environments and encounter life-threatening situations. The Warfighting Lab recognized that tactical units need a small, low-risk capability to conduct RSTA and enhance small unit force protection to reduce danger to Marines. A Universal Needs Statement was developed that identified the requirement for a family of RSTA sensors. Dragon Runner aims to address a number of these capability requirements. Dragon Runner is managed and partially funded by the Marine Corps Warfighting Lab. The Office of Naval Research also provides funding and the system is being built by the Naval Research Laboratory and Carnegie Mellon University's Robotics Institute. Dragon Runner will increase a Marine's situational awareness by providing observation of tactical objectives and potential danger areas beyond his line of sight where human access is impractical or unsustainable. The system will enhance force protection by standing watch in "Sentry Mode" by using several on-board sensors to provide real-time imagery and audio alerts. 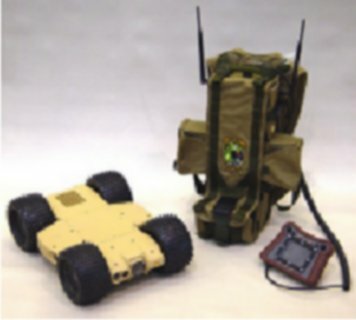 The prototype Dragon Runner Mobile Ground Sensor System consists of a mobile ground sensor vehicle, a small operator control unit and a simple user interface. It includes video, audio, and motion sensors and the capability to collect imagery during daylight and darkness. The system will be easy to operate, requiring little formal operator training. At 15.5 inches long, 11.25 inches wide and five inches high, Dragon Runner will fit inside the standard Modular, Light Weight, Load Carrying Equipment (MOLLE) Patrol Pack. The total system will weigh 16 pounds. A non-active and invertible suspension enables Dragon Runner to be tossed through windows, up stairs or over walls for a rapid deployment capability. The user interface features a four-inch video display and home-gaming type controller for vehicle manipulation. The entire system uses standard military radio-type batteries for its power supply.